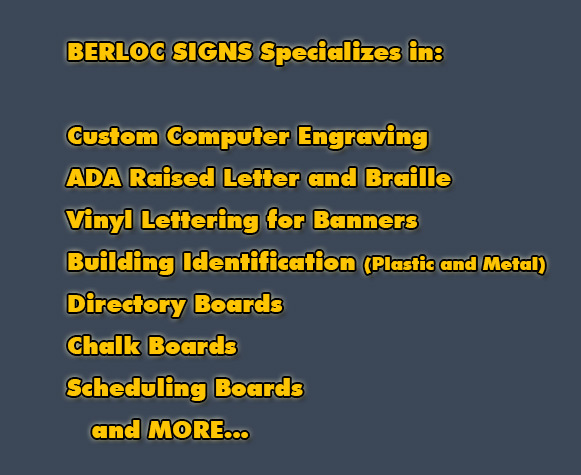 Berloc Sign Co. has been in business since 1946. We provide Quality Products and Superior Service. Customer satsfaction is our goal. And COMPUTER and LASER ENGRAVED signage including ADA - Raised letter and Braille. We also produce VINYL LETTERING for BANNERS, windows and other various signage requirements. In addiiton, we provide BUILDING IDENTIFICATION - METAL and PLASTIC LETTERING. We also supply DIRECTORY BOARDS, DRY- MARK LIQUID CHALK BOARDS, BULLETIN BOARDS, CHALK BOARDS and SCHEDULING BOARDS. Call for more information about our products and services.